I spent a day in Argao recently and was pleasantly surprised to find several dependable and free Wi-Fi hotspots. I was surprised because in Cebu City, free Wi-Fi access isn’t as widespread as they say it is in places such as Davao City. Many shops, at least the last time I went warbiking or going around on a motorcycle to check for free Wi-Fi hotspots, just depend on the services of Globe and Airborne Access for their customers’ wireless Internet access. MUNISIPYO WI-FI. 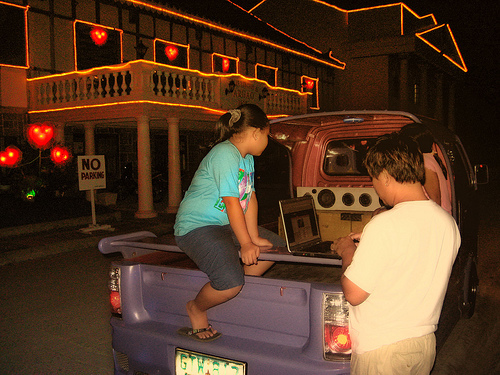 A man browses the Internet at the Argao town plaza. The Municipal Government turned the Spanish-era pueblo into a free wireless Internet zone last year. The municipal government has turned it’s beautiful plaza into a free Wi-Fi zone. There you are—surrounded by Spanish-era buildings, three cannons once used to fight pirates, beautiful masonry, and music that comes from cleverly-hidden speakers—and you have free high-speed wireless Internet access. I’ve been meaning to map Cebu’s Wi-Fi hotspots for more than a month now. It is a project that I’ve kept putting off, mainly because of work deadlines and other tasks. For a while, I planned to set out–and was on the verge of doing so at least twice–and go through 4 or 5 coffee shops and restaurants in a day to find out 1.) whether they provide free Wi-Fi access and 2.) how good the connection is. I am a recidivist coffee drinker, having kicked it out of my system for a few weeks last year, but still, the prospect of a caffeine overdose (not to mention wrecking my poor excuse of a diet) kept stopping me from starting with the Wi-Fi mapping.